Termites in Cambodia have a new invader to contend with. It’s ironic that termites invade our homes and now are victims of an invader in their homes and gardens. The recently discovered beetle is like the grasshopper in the fable “The Grasshopper and the Ant.” The beetle does no work, it doesn’t even fight with the termites, like their enemy the ant would do. The beetle simply lives inside the termite colony and eats the fungus grown in the termite garden. The beetle has paid for its crime with crippling bites about its legs. The beetle, since it no longer needs eyes to travel, is almost completely blind. The beetle has a handle on its back, similar to the larval termites, so that it can be carried to food or safety. The “new” species is the “Eocorythoderus Incredibilis” and was discovered by Maruyama Munetoshi of The Kyûshû University Museum in Japan. When ants or flood waters invade the colony a team of workers strives to move the larvae to safer ground. The beetle gets moved right along with the larvae because the termites, in their blindness, can’t distinguish between the two. 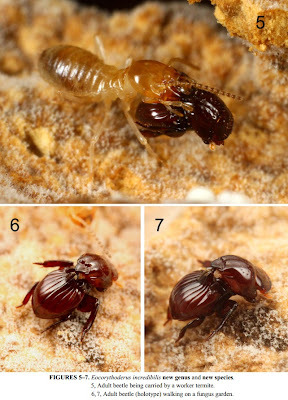 The beetle secretes a chemical that makes it “smell” just like the termite larvae. This beetle, living in the lap of luxury exhibits what my grandmother used to call “the height of laziness.” The beetle has evolved to the point that it needs no wings to fly. The beetle is a true parasite, invading the home of the termite and stealing the food meant sustain the termite city. There were only ten of these beetles found alive in the over 130 “gardens” that were researched. The beetle is not even strong enough to become a threat to the termites and so shows no useful purpose. My grandmother would have said that this is the price paid for laziness, but one might wonder if the flightless beetle was born this way, perhaps there is a reason. In nature only the strong survive and most species do have a purpose. Perhaps the reason there are so few and they are so weak is because this is an emerging species rather than one dwindling towards extinction. Only time and further entomological studies will tell. Termite treatments in Arizona are committed to finding the correct balance of nature, where termites can exist in harmony without damaging our homes and property. Termites are one of the creatures that are necessary to balance the soil and our ecosystem. They destroy vegetation that would otherwise take many years to decompose. The problem is that termites can’t tell the difference between property and waste wood. Termites pose a problem in every populated area on the planet and their numbers have been increasing, in spite of rigorous controls. Termite damage affects more than fifty percent of homes in the US. The only way to prevent termite damage is with vigilance. Home owners should have their homes inspected at least once per year and follow the plan of action laid out by a licensed termite control technician.